Welcome to another Medieval Monday hop and a chance to win our First Encounter theme eBooks just by following our blogs and commenting! 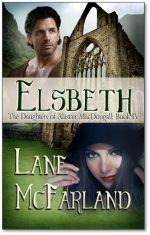 This weeks guest is Lane McFarland and her snippet from Elsbeth. Happy reading and enjoy. The sister’s violet eyes captured Brandon McLeod’s attention. A white coif surrounded her flawless skin, and he held back a staggering desire to touch her cheek. Would it feel as soft as it looked? She leaned to the left and wind caught her habit, wildly whipping the black fabric behind her. Stinging sleet peppered his face, and he mentally shook himself. The cold had obviously addled him. The woman was a nun. Join Lane next week to find out what happens at Elizabeth Hobbes’s blog here! You can find my 5th week excerpt of For All of Ever on Lane’s blog here, too. Thanks to everyone who leaves a comment and good luck. Remember… the more you comment and follow us, the bigger your chances to win! Elsbeth and Brandon are both doing what they believe is right. It appears that fate has a different course in mind for them. Intriguing – certainly will propel a purchase! Your description of his shock is great! Sou d’s like a very good book. I will have to add it to my TBR list.